Find a galaxy full of LEGO® Star Wars(TM) ideas to build--from activities and art, games and challenges, to practical makes and your very own inventions! This book features 200 imaginative play and building ideas, from LEGO projects that take just a few minutes and a handful of bricks, to builds to keep you occupied for hours. Set up a game of LEGO Star Wars skittles, create a pencil pot shaped like your favorite Sith or Jedi, build a fleet of tiny TIEs, design Darth Vader's family tree, and customize a podracer. Challenge a friend to take on a rathtar, mix up your minifigures, stage your favorite movie battle scene with LEGO StarWars bricks--and much, much more! 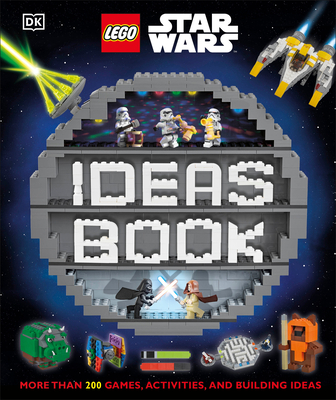 LEGO® Star Wars(TM) Ideas Book is packed with a family friendly range of activities to inspire every LEGO Star Wars fan. What will you build? LEGO, the LEGO logo, the Minifigure and the Brick and Knob configurations are trademarks of the LEGO Group. All rights reserved. ©2017 The LEGO Group. Manufactured by Dorling Kindersley, Strand 80, London, WC2R 0RL under licence from the LEGO Group. © & TM 2017 LUCASFILM LTD. All rights reserved. Used under authorization. Elizabeth Dowsett is the author of LEGO Star Wars: Revenge of the Sith, LEGO Star Wars: Attack of the Clones, and more.